Editorial: Adam Monast offers an argument against the death penalty in this week’s editorial article. Your feedback and suggestions are welcome! We are taking a break this week to examine our news site and make adjustments. If anyone has ideas to make it more user friendly, streamlined, or any other improvements, please contact me or leave us a comment! Thank you very much and have a wonderful Spring Break! 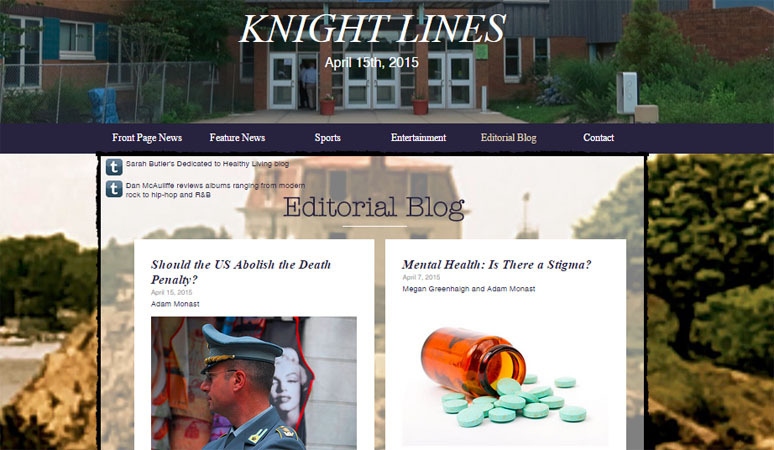 Here’s a link to our first edition…it includes details about all the ways to access Knight Lines . Please explore around the site to read all of the articles and see all of the videos students have posted over the past month. You can also choose a category – Opinion, for example, and read all the topics explored by our students.